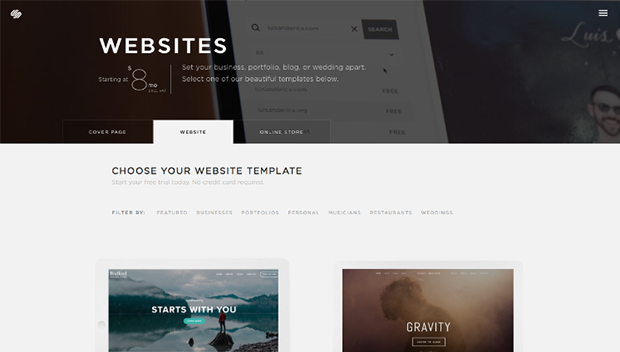 Founded in 2004, Squarespace is a convenient all-in-one web builder, hosting provider and blogging platform provider. With fabulous, responsive designs, Squarespace became known as the hippest of the web builders. However, advanced functionality has put the company squarely in the mainstream. If you check out Squarespace websites, you’ll see just how great they look. But are they easy to build and maintain? Let’s find out. These days, it seems to be popular to start things in a reverse order than we’re used to. 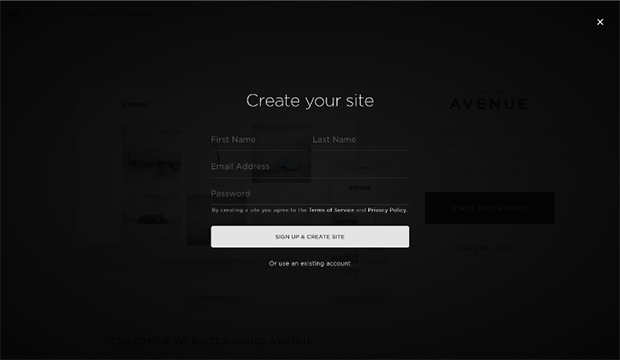 Instead of providing your information first, Squarespace initially asks you to decide if you want an online store or a website. Next, you will pick your design (you can still switch between a store or website). After that, you’ll need to provide your first and last name, email address and password. Then you’ll be welcomed and asked what is your website about. Initially, you’ll get a 14-day free trial. After the 14 days are up, you‘ll be asked to provide payment information. You will automatically be given a free domain, but it will have the squarespace.com extension. You can point to a third-party domain, but if you buy a yearly plan, you will get a free domain with the .com, .org, .net, .biz or .info extension of your choice. After you complete the registration process, you’ll automatically be taken to your website editor. 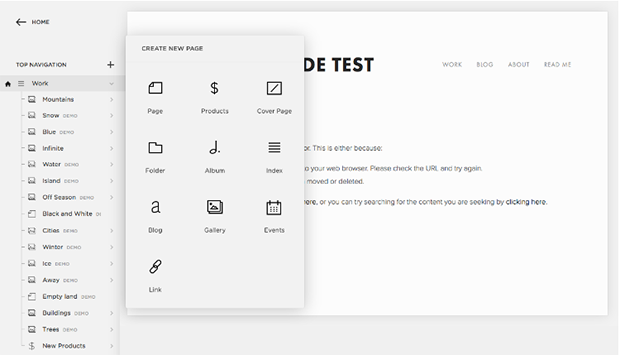 The editor is minimalistic and really beautiful, but we had the feeling that design was often given priority over drag-and-drop options. Compared to the competition, this editor had a slightly longer learning curve. But the design is covered so beautifully that you’ll end up with a stunning website. During the trial period, you’ll have time to become familiarized with most of the options Squarespace offers. If you decide to stay after the trial period, you’ll have to pony up. Of course, the more you pay, the more options you’ll receive. If you just need an informational, single page website, you can do that or you can go with the most expensive plan and have a really powerful commercial page with a robust online store. However, it is a nice touch that it’s free to connect an external domain, because this isn’t always an option. Unlike many website builders, visitors won’t be able to see your website after the trial period, until you’ve purchased a package. With the cheapest plan, you’ll get a website that covers your needs if you just want to provide information. But, if you want more pages, contributors or metrics, you’ll have to pay a little more. Go with a more costly plan and your transaction fees will be reduced, or even waived. And you’ll get unlimited products, commercial metrics and even real-time carrier shipping. All in all, commercial options get better the more you pay. Also, you’ll never have to deal with native advertising. As we mentioned before, the editor is drag and drop—with a bit of a learning curve. Everything looks polished and may seem a little intimidating to total beginners. However, you’ll appreciate the design of the editor once you learn your way around it. It may ask for an extra click or two, but in the end, the results are quite elegant. There is no permanent toolbar, instead, you’ll get a pop-up dialog box with all the necessary options for the element you’re editing. On the left side of the screen, you’ll see six tabs: Pages, Design, Commerce, Metrics, Settings and Help. Pages are self-explanatory. In addition to the standard functions, Design gives you the ability to have custom CSS, an announcement bar and even use a custom font when you’re working in the advanced area. Commerce isn’t your online store where you can upload your products, but you will be able to manage orders, inventory, discounts and payments. Metrics are beautifully laid out and allow you to see data such as traffic overview and mobile usage. Settings are divided into three general areas: General, for your business information, Website, where you manage basic information, domains and emails, and Commerce for commerce settings. Lastly, Help will take you to Squarespace support. Additionally, you can hide the menu and have a preview of the current page by clicking the arrow in the top left corner. When it comes to customization, it seems you can edit and adjust absolutely everything. Some people might find this overwhelming, but it’s actually great. There are galleries and media management, social networks integration, blogging tools and much more. We particularly like the custom font option, the custom logo maker and the store management. Editing options for your images are exceptionally robust. On the downside, Squarespace offers a lot of great widgets, but sometimes you want to spice things up with third-party widgets, which is not an option. Also missing is the native email client, which is pretty much standard with the all-around hosting platforms. The only thing that‘s not drag and drop with Squarespace is the placement of pages. If you want to have a subordinate page, you can’t drag it onto the page you want it to be, you need to use a page organization system that uses folders. This is an additional step which may, initially, cause confusion. A word of caution: different plans have different storage, page numbers, etc. Although on paper it looks great, we had a feeling that some options are a little bit more restricted than those of the competition. And there is a serious omission in that you can’t install third-party applications without HTML knowledge, so forget about a one-click solution for now. All Squarespace designs are responsive, which means you won’t have any problems with the mobile versions of your website. All the templates are gorgeous, but be aware that some templates are only available for websites and some only for online stores. Other templates are available for the more expensive plans, but all in all, even with the cheapest option, you’ll end up with great design. However, mobile designs, though attractive, offer few opportunities for customization. This isn’t a huge deal, but it’s always nice to have more options. We were delighted to see you can offer physical, digital or service product types in your store. Very often, all three aren’t included. By clicking on the type of product you want to sell, you’ll be taken to the appropriate editor. Managing the store on Squarespace was one of the most enjoyable parts of the whole experience because it is stylish, easy and truly fun to use. However, be aware that certain plans limit the number of products you can offer, so choose accordingly. 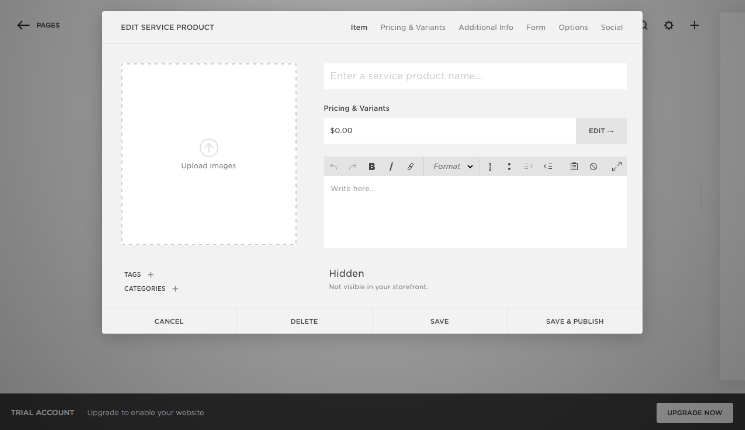 Additionally, Squarespace uses Stripe, but you can integrate PayPal and Etsy buttons. These days, if you want your statistics to be captured and analyzed, you will be often referred to Google Analytics. Although we love the Google product, it’s refreshing to see someone offering native statistics. As we’ve come to expect with Squarespace, the statistics are so stylish that it’s a pleasure just looking at them. And you always have the option of using Google Analytics, if that’s your preference. Hidden in the editor under Metrics, you’ll see data which includes: traffic overview, mobile usage, RSS subscribers, referrers, identification of the most popular content, search engine and site-search queries. When it comes to SEO, the basics are covered, but what we really like is the ability to customise your URL, which, strangely, is not a common option with website builders. As is typical with most online web services, you will get free hosting with any plan—with no fuss and no separate process. If you have your own domain, connecting it will cost you nothing. If you don’t have one, you will get it for free with a subscription of one or more years. You will be limited to the following extensions: .com, .org, .net, .biz or .info. You can import external blogs if you have them on WordPress, Tumblr and some of the other popular blogging platforms. And when it comes to exporting your Squarespace website, you have one option: export to WordPress. It’s nice to have the option of taking your site with you if you decide to part ways, because starting from scratch again is a real pain. 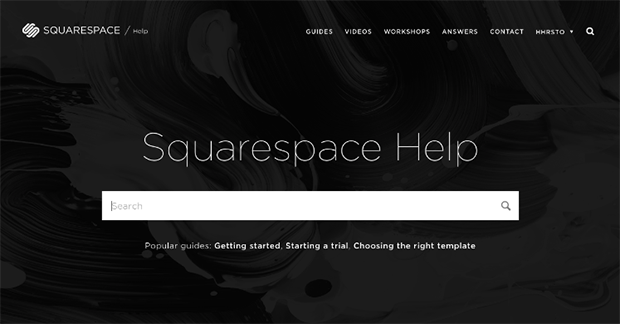 Squarespace went all (media) out when it comes to their knowledge base. You will have guides separated by category and videos, too. If you live in New York, you can even grab a personal one-on-one workshop with their team. Tickets are usually answered within one hour and a lot of questions you might have are already answered in the community pages. Their support is 24/7 through live chat, email or their official Twitter help account. The only thing that’s missing is telephone support. However, since live chat is available 24/7, with helpful and polite staff located in New York, Portland and Dublin, we don’t really miss it much. We guess you can’t have it all, but at least you won’t encounter the dreaded “putting your call on hold.” You win some, you lose some. After the initial 14-day trial period, if you decide to stay with Squarespace, you’ll be able to choose between five plans. All prices reflect billing on an annual basis. 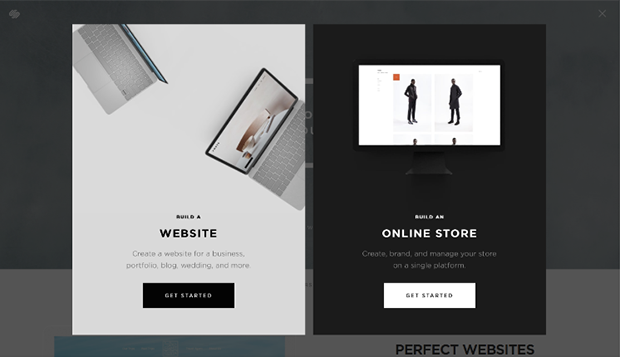 Whether you want a simple one-page portfolio website or an intricate monster website with a blog and huge online store, Squarespace has something for you. It’s beautifully designed inside and out and by that, we mean that they have one of the most attractive website editors out there and you’ll end up with a beautiful website whether you want it or not. Integrated metrics and SEO management are pretty and powerful. Mobile friendly and powerful, when it comes to e-commerce, there is a lot of potential. And the option to export to WordPress is a big plus and shows the great confidence of their team. However, Squarespace does have a learning curve and may seem overwhelming at first. But it’s not that hard to master and there are a lot of tutorials if you get stuck. The lack of easy integration of the third-party widgets is the biggest drawback that we’d like to see corrected in some of their future incarnations. There are some other annoyances like missing native email clients and awkward organization of subordinate pages. Pricing might be a deciding factor, but you have a 14-day free trial to test it out before you commit. 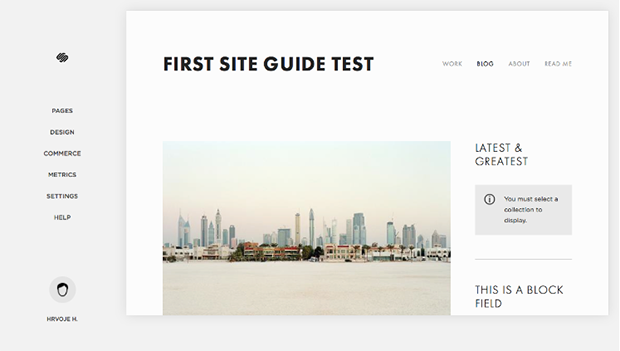 Squarespace may not be perfect, but it’s pleasing to the eye and pretty damn close to it!